The pattern is my own design, though I relied heavily on cushion and bag pattern pictures on Ravelry and photos on Pinterest. The yarn is Loops & Threads Impeccable (except for the black) and I used a 5mm hook. It resulted in a fairly stiff fabric, which is fine for a bag, but if it was a wearable item I’d definitely use a 5.5mm. The lining fabric is from the store where I work, and is a very appropriate peace sign print. I added a pocket in the lining, and a magnetic button for the top closure. This was quite fun to design on the hook, and even the unravelling and redoing of the front windows (the stranded look was crappy so I changed it for intarsia) didn’t take long and wasn’t onerous. I’m glad I did it as I wouldn’t have been 100% happy with the finished object otherwise. I learned something new today. I can take reasonable photos with my phone (which is just an inexpensive Android) and upload them to my Windows laptop easily. Why has it taken me so long to actually use the phone for more than texting? I was out with a girlfriend today, walking along the waterfront at a small town just south of my own, enjoying a London Fog and a large slice of vegan orange date walnut loaf, and sunbathing at the sheltered bay which is such a popular swimming spot in the summer. It was a comfortable temperature, mostly sunny, maybe around 25 Celsius. The lake is higher than it’s ever been in recorded history, thanks to a rainy spring and the melting of the snowpack at higher elevations, so flood barriers have been set up in many places to try to hold back the water from flooding backyards and basements. Along one stretch of our walk, the road was closed to traffic and there were hoses stretched across the road where people were pumping excess water from their properties back into the lake. Or at least trying to. I’m not sure how successful that can be when it must surely cycle back in. Ironically, the extra water has not resulted in more watery activities, as swimming and boating are not recommended because of the detritus in the water. Kayaking and stand-up paddleboarding seem to be the better options. The beaches have disappeared and the mosquitos are having a field day because of the increase in stagnant water. This bag, which I probably shouldn’t claim to be a VW camper van for fear of trademark infractions, is for my niece. When I was on holiday visiting the family she nicely asked if I would make her one. There’s a couple of patterns on Ravelry that helped me come up my own plan for the bag, though I still don’t know what type of handles/strap it will have. So far, I’ve made pretty good progress on the front. I’m not 100% happy with the edges of the colour blocks but I don’t think there’s a way to avoid the unevenness if you’re working back and forth. The edge stitches look different on the left and right of the V – the ones on the right are beautifully smooth. Also the two white stitches in between the windshield sections are a bit untidy. 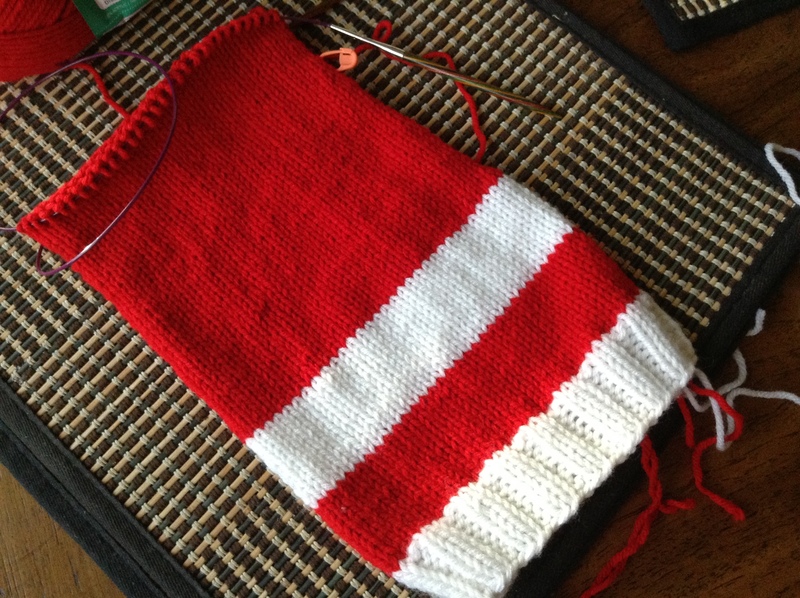 I used intarsia on the blue/white part and stranding on the grey/white, and I think it would have been better to have used intarsia throughout. Ah well, it was a good day. Nice to be out in the sunshine instead of stuck inside, either at home cleaning or at work. Tai Chi Man has fixed the J brackets to my roof rack, so I am ready to load up a kayak or two at a moment’s notice. Hoping to actually get out on the lake for the first time in ages, sometime this week. I hope your week is awesome! I think I’m safe to post this here as my Jersey (British Isles) family doesn’t read my blog (except maybe for my mum and she won’t tell). I had a Michaels email yesterday – my usual routine when those arrive is to keep the most recent one, just in case I find myself in need of a coupon, but this time the info was somewhat more interesting. All yarn on sale? Hmmm, have to check it out. When I arrived, the employees were frantically opening towers of cardboard boxes and stocking the shelves, and at first I thought I might get Lion Brand Vanna’s Choice because it was about half price. However they had no white, and I need white for the main colour of my next project. I went off to Costco and when I came back there was still none, so I looked at the Loops & Threads Impeccable. 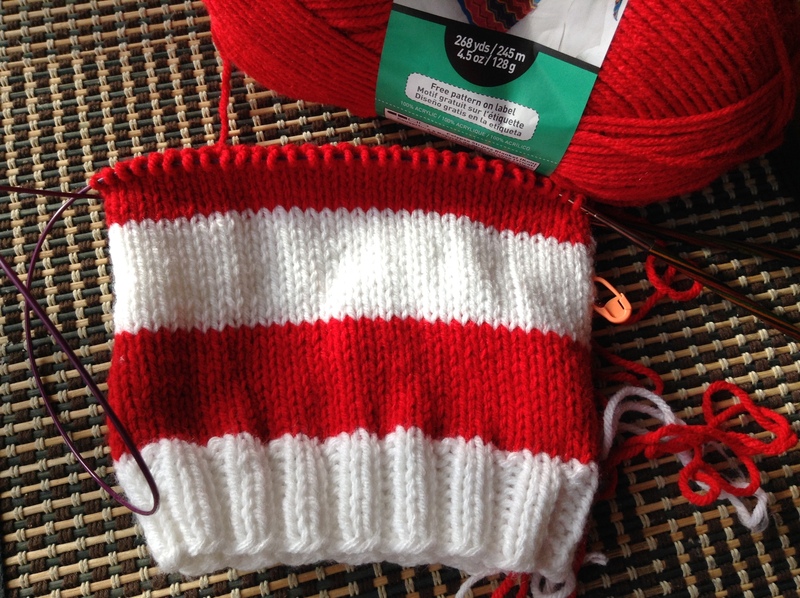 A similar 100% worsted weight acrylic, not quite as soft as the Vanna’s, but less money and more yardage per ball. The colours are white, four shades of green, yellow, purple, orange, royal blue and cherry red. The purple looks blue in the photo for some reason. They are 4.5oz each, so bigger than the usual 3.5oz put-up. That haul of 12 skeins cost me $30, which I think is a good deal as I will have enough to be able to make this blanket AND this cocoon/hat set (Ravelry links). I already bought the board book and I feel that this combination will make a nice newborn gift for the new parents. I will need to have it all finished by February to allow for snail mail, so no rush for the deadline. It’s been a gloriously sunny day here. After my piano lesson I met a friend for tea and we sat outside the coffee shop for an hour, enjoying the rays. Not bad for November, eh! I mentioned granny slippers in my last post. But I didn’t tell you about those. I took photos the other day and didn’t get around to blogging about it. …and took some Loops & Threads Impeccable, my new Addi hook and the bobwilson123 Granny Stitch Slippers pattern. …sitting in the car while waiting to pick up ds2 at college. …and almost finished the first one, except for the single crochet around the top of the foot. I’ve made a few pairs of these now and they are quick and easy and great for keeping in a basket next to the front door for visitors. 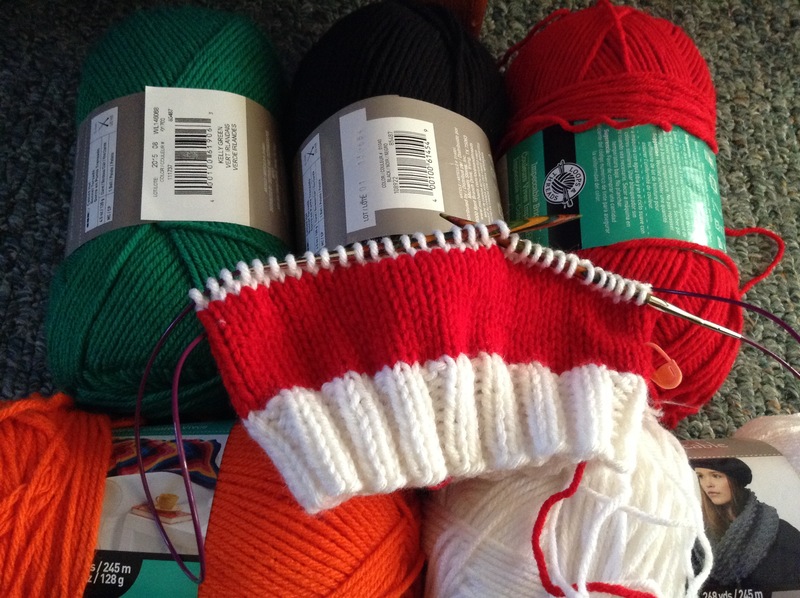 Crocheting in Public – it’s so cool! And it really gets things done.